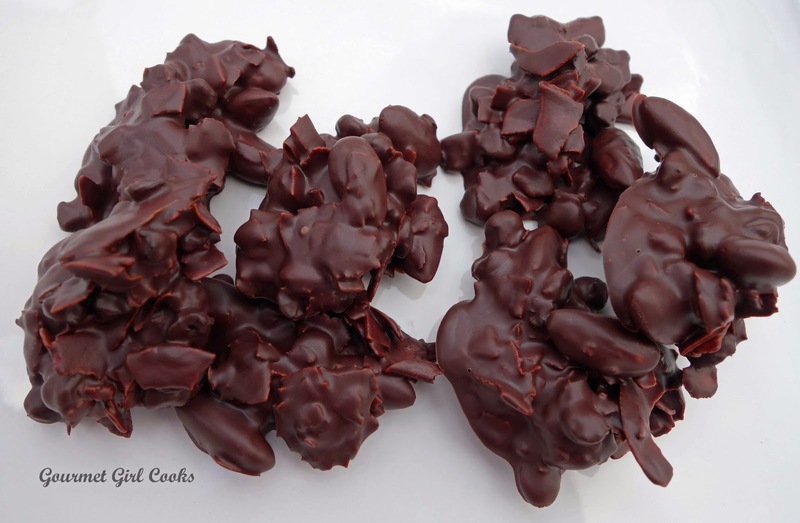 Do you really love chocolate but get tired of eating the same plain dark chocolate all the time? Are you longing for a little crunch, or a little chewiness? I have always loved crunchy toasted almonds in my chocolate -- it's actually my favorite combination. 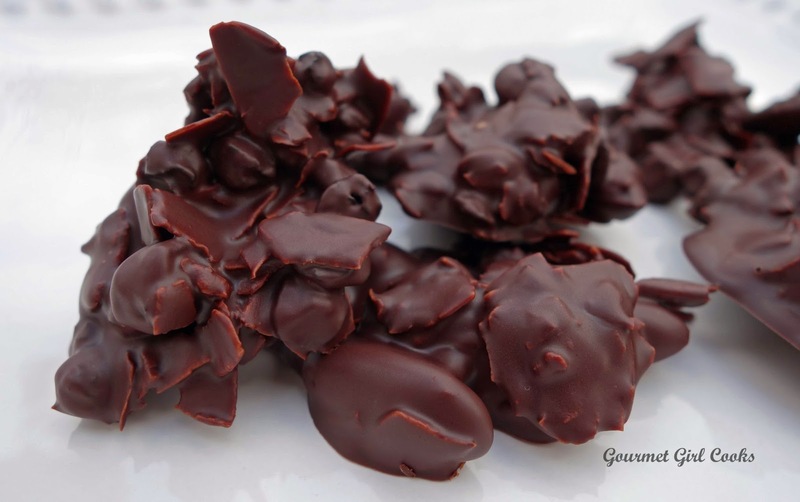 This evening I was in the mood for something totally different -- I wanted chocolate with almonds but I also wanted something more...so I made some easy but delicious and totally different chocolate almond clusters. 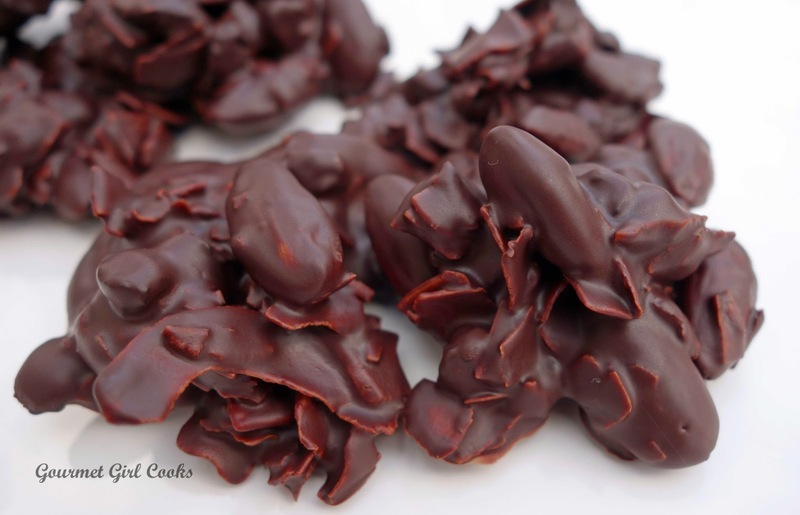 I melted dark chocolate and added some large toasted unsweetened coconut flakes and chewy unsweetened dried blueberries that added a raisin-like chewiness...and then added a dash of ground chipotle chile powder for a subtle spicy undertone. These were so easy to make that it's quite possible you might shed a tear or two at how easy they are to make! ;-) I took a 3.5-ounce dark chocolate bar (you can use your favorite brand with anywhere from 70-90% cacao) -- I usually prefer Green & Black's or Lindt's 85%. I broke it up and placed it in a small bowl and melted it in the microwave on high in 30-second intervals, stirring after each -- it only took about 1-1/2 to 2 minutes to melt. I stirred in 1/4 cup roasted salted whole almonds, 1/4 cup toasted large coconut flakes (toasted in a 350 degree oven for 5 to 7 minutes until golden brown) and 1/4 cup unsweetened dried blueberries (by Bob's Red Mill) and then added a dash of ground chipotle chile powder and stirred it all together. I let it cool slightly to thicken just a little bit so it wouldn't run and spread out too much when I spooned it onto a parchment paper lined cookie sheet. Using a large tablespoon and a small rubber spatula, I spooned 9 clusters onto my cookie sheet and popped it into the fridge to set up for about 30 minutes. All I can say is...OMG...they were chocolatey, chewy, crunchy, coconutty, slightly sweet, slightly salty with a very faint hint of spicy...it was all my favorite flavors rolled into one little cluster. I really enjoyed having a "gourmet blend" of chocolate mixed together in 5 minutes. I snapped a few photos for you to see below. You can easily add or substitute your own favorite flavors to make them your own. You can find most of these ingredients in your local grocery store, but I have provided affiliate links in case your store does not carry a particular item. Enjoy! Hi GG, I just received Cacao butter and cacao paste and chocolate bar molds as I was planning to make some treats for my daughter who is under a lot of stress. As she is not as sensitive to sweetness as we are,( none of my family has joined me in the grain free movement) would it be alright to sweeten with Swerve or should I use a liquid sweetener?